Amino acids are seldom individually listed on nutritional labels. They are usually just grouped under ‘Protein’. This can be problematic for vegetarians or anyone who has a reduced meat diet. While most meats and dairy are considered ‘complete proteins’ as in they contain all 8, there are no plant based complete proteins. Many are close, like for example soy or rice, but they have limiting amino acids that leave them lacking. Not getting enough of any of the 8 could lead to energy loss, or poor brain function. While you do not need to have all at one time necessarily, it is best to consume all 8 within 4 hours. So if you eat breakfast and are lacking one, make sure you get it in your lunch. 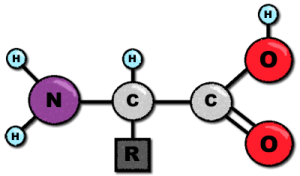 Amino Meter also includes Histidine, which is only essential for infants, but also is related to sexual health.